A Newcastle woman has helped to raise valuable funds for a new Marie Curie Cancer Care fundraising charity group. Instead of sitting back lavishing in presents on her seventieth birthday from family and friends, Mary O’Hare from Newcastle will remember her special day for a different reason. 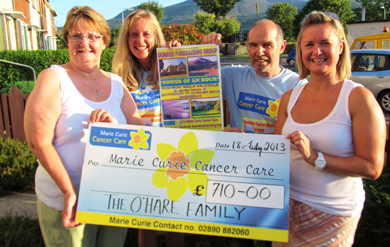 Mary O’Hare from Newcastle is pictured donating a cheque for £710 to Jacqui Mason and Paul Madden from the newly formed Marie Curie Cancer Care Newcastle area fundraining group with Mary’s daughter, Kate Pell. With the help of her family, they all celebrated her seventieth birthday with a party on Saturday 13 August at Bryansford GAC and invited guests to make a donation to the recently formed local Donard Fundraising Group for Marie Curie Cancer Care in lieu of presents. Instead of receiving, Mary decided altruistically to give all of the donated proceeds from her party towards the group’s inaugural ‘POWER OF AN HOUR’ fundraising event. Jacqui Mason, local group marketing officer, said: “The local Marie Curie Cancer Care group aim to raise enough money to pay for ‘600 hours’ of local palliative Marie Curie Nursing Care, for anyone in the Newcastle area who has cancer or a terminal illness, and requires this essential, compassionate and dignified care in their home. Mary O’Hare said she was deeply impressed with all the help and donations she received. She said: “The O’Hare family would like to say a very sincere and heartfelt thank you to all of the family, friends and neighbours who gave so magnanimously. “I’ve had lots of birthdays and this one was special as it was to support a good cause, one which touches so many families. Cancer charities are something we need to support as they provide such vital care when we need it most. I really initially just wanted a wee party but as the Bryansford GAC has just reopened we decided to have the party there and it grew bigger. “My daughter Kate knows Paul Madden in the local Marie Curie Cancer Care group so before we knew it it became a party to support this very worthwhile cause. My husband and I celebrated our fortieth wedding nine years ago and we donated the proceeds back then to Marie Curie Cancer Fund. We just thought this would be a nice gesture. Paul Madden, Newcastle Marie Curie Fundraising Group Chairman, said: “We are both humbled and overjoyed to receive such kindness and largesse by Mary’s act of selfless concern in caring for other people who are ill, and putting their needs above her own. “We wish to express our profound gratitude to the O’Hare family and everyone who gave so magnificently, which will help us immensely in our aim to fund and provide locally ‘600Powerful Marie Curie Nursing Hours’. “If anyone wishes to enter our ‘POWER OF AN HOUR‘ Fun Run, Walk or Cycle (3/5/10km) for all ages, on Saturday 17 August in Dundrum, registration forms are now widely available in local shops and businesses in Newcastle, Dundrum, Castlewellan and their surrounding villages. telephone 07974 392790, 07734 248338 or 07599 809280. 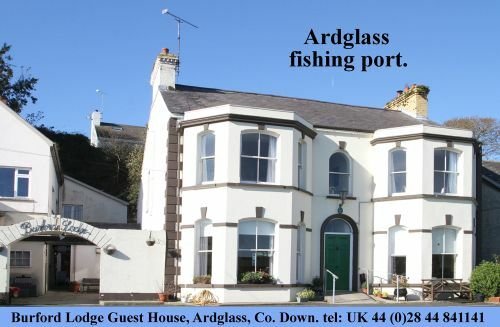 “Anyone unable to participate and who wishes to make a donation to the fundraising events, or to the Donard Fundraising Group in general, can do so at any time by clicking onto the JustGiving links which accept all debit and credit card donations, and our two JustTextGiving links on Facebook which allow you to donate anything from a £1 upwards from your mobile phone,” added Paul.